Which type of tooth whitening is better? This is the common question asked when someone comes to me to do teeth whitening. I would not answer the question in this manner. I would rather compare it based on the needs and compliance of the individual. If you are getting married tomorrow,then obviously you will need to get an “instant” whitening ie the chair-side in-house whitening.On the other hand,if you are generally a compliant and disciplined person who is willing to listen to your dentist’s instructions :),then go for the take-home overnight whitening. The end result? They both give you white teeth. Below are some before and after pictures . The 1st picture was taken in June 2009 .The 2nd picture was taken 2 weeks later after using the take-home whitening which was applied on the upper teeth only. This lady of 68 years old, continued with the whitening procedure for her lower teeth for another 2 weeks. (This process can be done together ie the upper and lower teeth can be whitened at the same time).The 3rd picture was taken recently in September 2010. obviously the patient is very happy with the results. 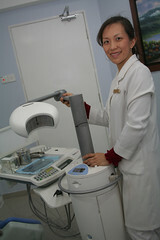 The above are pictures of a chair-side whitening patient,obviously a very happy young lady of 19 years old. In summary,you can will get results irregardless of the type of whitening you do. I have always wished that teeth whitening was more affordable so that it is accessible to most people.The fact of the matter is that most of us wish we had whiter and brighter teeth but the main damper is the cost of the whitening. I have been doing in-house professional whitening for my patients for more than 2 years now and yes,we do get satisfying results,in various degrees.However,in Malaysia,any kind of in-house or chair-side whitening will cost quite a bit ,especially where light-activation whitening is involved. When I went to US last October to listen to some of the gurus of whitening, they were talking about whitening treatment that is growing exponentially in the US over the last 2-3 years.And interestingly, the type of whitening they talk about is that of dentist-supervised take-home whitening. Take-home whitening as opposed to in-house whitening is where your dentist makes custom trays to fit your teeth and dispenses whitening gel for you to wear the trays with the gel in it overnight.The downside to this is ,you have to be compliant in wearing your trays and to do it as instructed by your dentist.And it takes at least 2 weeks or more before you see good results.Now,if you REALLY want whiter teeth,and you do not want to pay a lot for it,you would be compliant and you would be patient,right?? Well,here was an option to whiten at a much lower cost and most importantly,it works.In fact, more than that,the product that was presented to us contained PF,a term used to describe a combination of potassium nitrate and fluoride. (Potassium nitrate is the ingredient used in desensitizing tooth pastes and fluoride in safe amounts, has been proven to reduce tooth decay when used in tooth pastes as well as when it is topically applied on the teeth by your dentist.) So here we have not just a product that whitens but also reduces tooth decay and provides desensitizing effect during the process of whitening.It has also been proven to harden the enamel of the teeth over the period of use. Take-home whitening is something that has been around for a long time.However it has obviously not lost its effectiveness with the development of newer and more superior products. 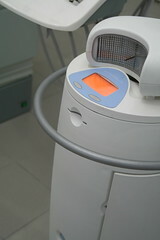 In this society where everyone wants things FAST,it may not sound very appealing.However,it is most definitely an option and take-home whitening has been proven to give better results when used long term because the rebound (to the oirignal colour) is a lot slower compared to chair-side whitening. There are some facts that you may need to know before deciding on whether you are a suitable candidate for tooth whitening. If you have significantly large fillings or crowns on your front teeth(this includes all the teeth that can be visibly seen when you smile widely,the you have take into consideration that these will need to be redone after tooth whitening as they WILL NOT be whitened along with you natural teeth.I am stressing on this because,most of the time we budget for something only to find out that the final cost is more than expected.So,it is vital that you check with your dentist who is going to do the whitening procedure for you. Pigments from our food and beverages( and nicotine from cigarette smoke ,for smokers)will get absorbed into our teeth. The peroxide in the whitening gel releases oxygen ions in our teeth and these ions chemically alter the stains and eliminate them.However,our teeth will continue to absorb stains.So,tooth whitening of any kind is not a treatment that has a permanent effect . 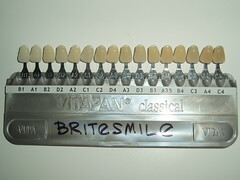 Some professional tooth whitening systems like Britesmile have their own follow-up maintenance products.These products are to be used regularly after the chairside procedure to counter and delay the relapse process .If you want to maintain bright teeth at all times,then you may have to consider repeating the whitening procedure every 2 years or so. Most of us do not have teeth that are even coloured where every single tooth and tooth surface is of the same shade.More often than not,we have the canines more yellowish ir darker.Some of us have a band of transluscence at the biting edge of our teeth,others have a darker band nearer to the gum margin.All these are due to the difference in the thickness of enamel and dentin on each individual’s teeth. Therefore,in cases like these,in total effect,your teeth will become a lighter colour but you cannot expect the entire surface to be of one shade ,or all your teeth to be of the exact same shade.This is because it is mainly your enamel that gets whitened by the peroxide in the whitening gel. I would like to mention tetracyline stains again. Depending on the severity of these stains,which are intrinsic in nature (ie,these are stains that were deposited when your teeth are in their developemental stages), your teeth can only be lightened to a certain degree and you probably have to repeat the treatment several times (ie escalated cost for you)in a short period in order to get substantial results.Even so,the brownish/greyish hue which comes from the inner dentin layer cannot be fully masked. So if you have tetracycline stains and you still want nice white teeth,tooth whitening is really not the treatment of choice.You would have to have ceramic crowns made for all the front teeth that are visible when you smile widely. Having said all that.most of us want a brighter smile,so if you have a reasonably healthy set of teeth n gums and you want your teeth to look brighter and whiter,then,tooth whitening is definitely an option. After doing numerous whitening procedures for different individuals in my clinic,I have come to learn some things about different kinds of responses to whitening. Generally,most people can achieve good results.It is especially impressive on smokers’ teeth.The before and after effect is quite remarkable.I have had a number of customers who came to do whitening as an incentive for themselves to quit smoking,and I commend them for it. As I have mentioned before,teeth that are tetracycline-stained usually do not respond well to teeth whitening.Tetracycline is a very strong broad-spectrum antibiotic which was previously widely used because of its effectiveness.However,when taken during teeth fomation,ie taken by a pregnant mother(with their fetus in permanent-teeth-formation stage) or by very young children(when the rest of their permanent teeth are still forming),it deposits on the dentin and enamel of the teeth and creates a permanent stain.These teeth has gray or brown stains either as a uinformed discolouration of the entire tooth or they may appear in the form of horizontal bands of stain.These bands can be of varying intensity and can appear form very mild to very dark in colour. These are just some examples which I picked up from the internet. As these stains are deep into the teeth(the deeper,the darker the discolouration),these tetracycline-stained teeth do not respond well to whitening.I heard a lecturer teach in a seminar that I attended recently that they may respond to a certain extend but the whitening procedure has to be repeated several times over a span of months. The other type of teeth that do not respond well to whitening are those with 2 tones of colour on their teeth.These are teeth that has a a more yellowish and opaque colour on the portion nearer to the gums and the portion nearer to the biting surface appears transluscent.Somehow,the transluscent edge does not respond too well to the peroxide as compared to the opaque portion.Therefore the overall result may not be as favourable,especially if the expectations are high. Speaking of expectations,I normally assess my customers before they proceed with the treatment,including their expectations.If it is unrealistic,I will discourage them from going ahead with the treatment.That is only fair.I believe this applies to all things. “As a dental practitioner, I’ve always wanted to have first-hand experience at tooth whitening to help me communicate the entire process more effectively to my patients. The market has been inundated with so many whitening systems that choosing a product can be quite a dilemma, even for dentists! After doing some research I settled on Britesmile. The entire process took one hour and consisted of three 20-minute cycles.The overall experience was comfortable though I did feel some pain towards the end of the 3rd cycle. Nevertheless it was bearable and I could continue with treatment and go about my routine afterwards. This sharp, tingling pain lasted about 12 hours. There are some commonly asked questions when it comes to professional whitening,apart from the question of cost. 1.How long does it last? As I mentioned previously,our teeth loses their whiteness over time and our lifestyle and diet would be the main things that will affect how white our teeth stay.After the Britesmile procedure,the effect lasts an average of 2 years and if you are a 3-pack-a-day smoker and compulsive coffee drinker(esp the Kopi O ‘kau” type),then you probably will lose it all in less than a year.However,there is a maintenace paint-on pen that you can use on a daily basis,and that will help your teeth stay whiter for a longer period of time. The process is actually quite comfortable as you are biting on little block throughout and therefore it is unlikely that you will suffer from a dislocated jaw or fatique.In the last 20 minutes of the procedure,as the peroxide gets into the outer dentin layer of your teeth,there may be a slight discomfort,likened to a tingling sensation.The various descriptions have been “sour sensation”,”someting is pressing on my teeth”,”clenching feeling on my teeth”,which basically describes the sensitivity that arises from you dentin being stimulated. After the procedure,a small number of individual may get some mild pain in the next 24 hours.This is easily controlled with some mild analgesics like Panadol. 3.What can I eat and what can I not eat after that? During the bleaching or whitening process,the pellicle layer ie a thin protein layer covering our enamel,is removed.Without this layer,our teeth will absorb stain very easily.Therefore it is of ultimate importance that you do not consume any coloured food or beverage over the next 24 hours,after which the pellicle layer will build back naturally .No oily food and no lipstick.And absolutely NO SMOKING! I heard of a case where a patient after doing whitening,rushed out form the clinic and lit up immediately(must be desperate!) and before he knew it,there was a black halo smack on his 2 upper and 2 lower front teeth!Bad mistake! That brings us to what can be consumed.Anything colourless or white,ie water,soya milk,bread without its crust,apple without skin and the list goes on. 4.Will I have Tyra Banks whiter teeth? Well,yes! Of course!However,do not set too high expectations as the results vary from each individual.Some people have thicker enamel than others,so the effect is much better.Others have 2 different shades on the surface of their teeth ie the area nearer to the gums are much more yellowish.Again this is due to the fact that the enamel is thinner in that area.So,the area nearer to the biting edge will whiten a lot better.You should generally be able to get at least 5 shades whiter than your original shade.Anything more would be a bonus. It looks like Hollywood does sell,even though I do not condone that generally.I had a young lady who came to see me in my clinic and she wanted white teeth like Tyra Banks.Fortunately, I have heard of Miss Banks.She is obviously a famous Hollywood celebrity and has a set of gleaming white teeth to die for. Another patient flashed her set of pearlies at me and asked me how white can I make them.”White?” I asked,”you mean like toilet-bowl white?”.That cracked her up and we had a good laugh together. Tooth whitening is becoming more than a novelty nowadays.Everyone would like a set of nice and white teeth to flash when they smile.And the options are available to whiten ones teeth.Of course there are limitations.If you have tetracycline-stained teeth,the effect may not be as good because these are intrinsic stains.Whiteining gel bleach only the enamel.Which brings me to the next point.If you have fillings or crowns on your front teeth,they do not get bleached.So you may need to consider other options. Our teeth will become yellowish from a natural aging process and also from differing lifestyles,like smoking,drinking coffee,tea,red wine etc.There is basically 2 types of teeth whitening.One is the take home tray,where you have custom-made tray with whitening gel in it to wear over your teeth for a number of hours a day.You may see some results after about 6 to 8 weeks of proper usage and usually the teeth will whiten by 1 or 2 shades.The other is done professionally in your dentist’s clinic and you get instant result in about 1 and a half hours and you get at least 5 or 6 shades whiter teeth. This is the shade guide that I use. I use the Britesmile Professional Whitening system in my clinic.After doing some research on my own,I realised that I wanted to use something safe above all things and it has to be fairly comfortable for my patients.The propriety gels used for whitening in the market contain between 15 to 37% of hydrogen peroxide.Naturally the higher the content,the faster the bleaching process is.However,we are talking long term effect here.I chose Britesmile because it uses a 15% peroxide gel but works excellently because the gel is activated by a cool,blue light which is shone on the teeth for three 20 minute sessions.Effectively,it is a 1 hour whitening process.The entire procedure usually takes about 1 and a half hours because I need to isolate(block out) the patient’s gums and lips before applying the whitening gel and activating it with the light. 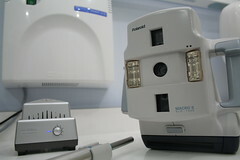 This is the Britesmile machine. I take a before and after picture with my Polaroid SLR-1200 along with the original tooth shade and the new shade at the end of the procedure. The results achieved have been very satisfactory and so far everyone who has gone through the procedure has been very pleased with the results they get.They go off with their own set of before and after polaroids and a whole list of dos and don’ts over the next 24 hours. Next,I will talk about some FAQs .